For both youth and senior players, your local soccer club or local community association is a member of the local district soccer association. The local district soccer association is a member of the provincial association (Alberta Soccer Association), and the provincial association is a member of the national association (Canadian Soccer Association). Finally, soccer is governed internationally by FIFA who appears at the top of this hierarchy. This structure creates an avenue for your input to be heard at all levels of the soccer hierarchy. 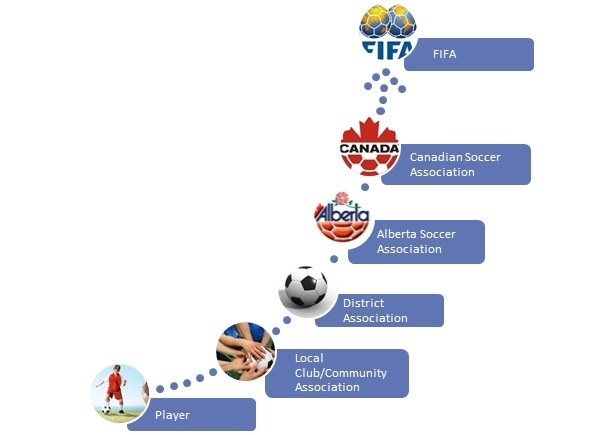 Issues of dispute are to be addressed at the most immediate local level first with appeal capabilities to the Alberta Soccer Association and even in certain situations to the CSA. The Alberta Soccer Association holds General Meetings with its District Members three times per year where input can be heard.